In the lab assay, we isolated biocontrol organisms from commercial biopesticides and then grew them at different temperatures (75, 50, and 42°F). All of the organisms grew very quickly at 75°F. At 50°F, which was close to the average soil temperature in the tunnel and is also the temperature at which many fungal pathogens become active, most of the organisms were able to grow very slowly, but Mycostop grew fairly well and outperformed all other bacterial organisms in both replications of the experiment. The two Trichoderma spp. present in Rootshield Plus grew at 50°F and also were able to grow, albeit slowly, at 42°F. In the field study, germination and plant stand was very patchy throughout the tunnel. This was likely due at least in part to pre- and post-emergence damping off, as signs and symptoms of damping off were observed on 13 Oct and Rhizoctonia solani and Fusarium oxysporum were isolated from affected plant tissue. The winter of 2015-16 was fairly mild; soil (2 in. 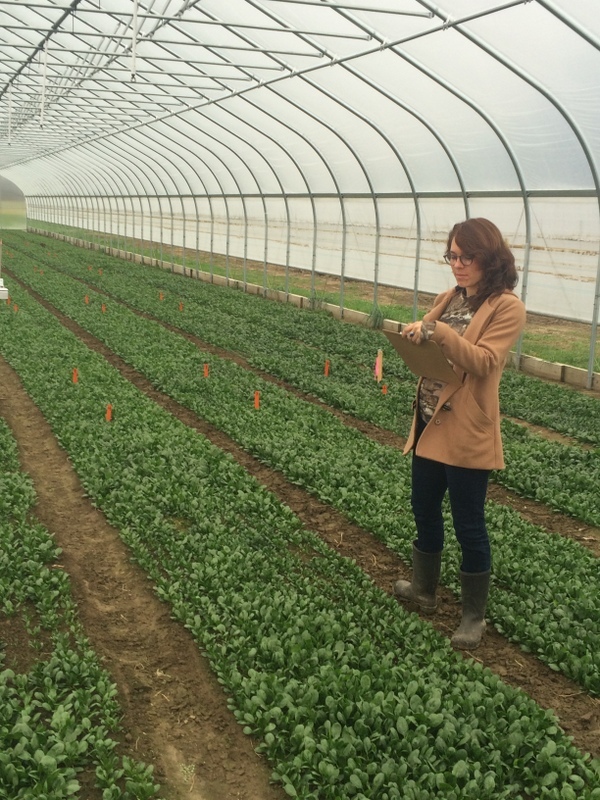 depth) temperature in the high tunnel plots 03 Oct 2015 to 03 Mar 2016 averaged minimum of 42.2 and maximum of 56.5°F, and air temperature averaged minimum of 32.8 and maximum of 59.9°F. The absolute minimum temperature of soil and air recorded was 30.8 and 8.7°F, respectively. Unfortunately, we were not able to distinguish any consistent, significant differences in germination, stand, vigor, or yield across treatments. Plant number and vigor decreased at the second and third time-points and then rebounded—this may have been due to post-emergence damping off. Plant number at the third time-point (20 Oct) was significant, with all treatments except Rootshield Plus performing better than the untreated control and Mycostop G performing the best. We did not see any Cercospora or Cladosporium leaf spots in any of the treatment plots, including the untreated plots. Conclusions: While none of the treatments made consistent, significant differences in overall stand, vigor, or yield, all products performed better than the untreated control during the early stages of germination and growth, and may be worthwhile for growers with soil-borne diseases in tunnels. Mycostop and Rootshield Plus may be better choices in cold conditions such as the winter tunnel environment. Furthermore, there was a really big range in cost depending on the material and the number of applications recommended (see Table 1), so that would be another thing to consider when choosing biopesticides and determining how often to spray. In the case of Mycostop, we feel a much lower rate could be used to bring down the cost per application. With other fungicides, information from the manufacturers was available to advise on the best rate to use, but in the case of Mycostop, we were not able to get more specific guidance from the company and so we used the highest labeled rate. Based on our findings, we feel that applications are most effective when soil is at or above 50°F, when beneficial microbes (and pathogens) are more active, so the number of applications made during the colder winter months can be reduced, further lowering costs. To read a full summary of our methods and results, please download the summary below.